Can we keep the Internet an open, democratic and free tool for the betterment of mankind? Barefoot into Cyberspace tackles this question. Written by a recent guest of ours on the Full Circle Podcast, Becky Hogge is a journalist and former director of the Open Rights Group. 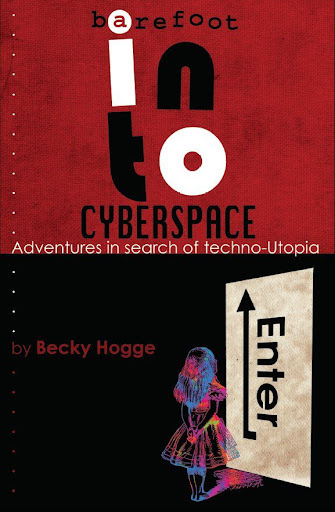 In it, Hogge seeks out the radical hackers opposing the old institutions gathering to control the Internet. Documenting a personal journey into 'hack-tivism,' Hogge begins and ends at the Chaos Computer Club's annual conferences in 2009 and 2010, in the company of four recurring guides; Stewart Brand, Cory Doctorow (author, blogger and copyleft campaigner), Phil Booth of No2ID and Rop Gonggrijp, co-founder of the Dutch ISP XS4ALL. Along the way, Hogge interviews Wikileaks' Julian Assange and Global Voices founder Ethan Zuckerman. Touching the issues of copyright versus copyleft, personal privacy, the surveillance society, freedom of information, censorship and the commercial takeover of the Internet, this is a study of individualists against institutions, questioning how we might oppose the vested interests of moneyed entities with largely amoral agendas. You also get the slightly anti-climactic story of how Hogge declined to join Wiki-leaks, albeit in recognition of the commitment it takes to be that kind of activist. This running series of encounters highlights the one weakness of a book that never quite ties together all its themes into one coherent narrative, but you could argue that's how life is, amplified by the disjointing effect of technology and the rapid pace of change. If you want a grand Donal MacIntyre-style expose of dark deeds, conspiracy theory and armed insurrection - this won't be the book for you. It's altogether gentler than that. Enjoy the retrospective of the “hacker” movement and origins of the 1970′s counter-culture; communes seeking freedom, peace and love, through the early examples of Brand, Stallman, Lessig and the pioneers of the hacker movement, which, remember, is about more than just getting free stuff. “I think most of what were fighting still today in the world is incompetence. Most of what we’re fighting is stupidity, and maybe a little bit of opportunism. There is also the ominous, control-seeking large corporate interests." "We come in peace. We’re not called Chaos Computer Club because we cause chaos. If anything, a lot of our collective work has actually prevented chaos by pointing out that maybe we should lay some decent virtual foundations before we build any more virtual skyscrapers."